E-1 Treaty Trader Visas and E-2 Treaty Investor Visas permit a foreign national to enter the United States to carry on substantial trade between the United States and the state in which the foreigner is a national (E-1) or to develop and direct an enterprise in which the foreign national has invested or is investing a “substantial amount of capital” (E-2). For the E-1 visa, the term “substantial trade” is determined by weighing the volume of trade, the number of transactions, and the continued course of trade including demonstrating commitments for future trade. For E-2 visa purposes, the term “substantial amount of capital,” referred to as a “substantial investment,” is not defined. There is no specific dollar amount that is required to be invested. The amount can vary from enterprise to enterprise and consulate to consulate. The greater the total size of the enterprise, the greater the investment must be. Some examples of active investments that can qualify the issuance of an E-2 visa include a retail store, a restaurant, an import/export company, and a real estate development company. The investment may include the purchase of an existing business. An E visa can be renewed in five year increments virtually forever, as long as the trade or enterprise is ongoing. As the terms “treaty trader” and “treaty investor” indicate, only foreign nationals of countries which have signed treaties of commerce and navigation with the United States are eligible for these types of visas. Spouses and children of E visas holders may accompany them to the United States, and spouses, in particular, are allowed to obtain work permits. Once in this status, a foreign national may consider applying for lawful permanent resident status through another or related vehicle. A foreign national who within the preceding three years has been employed abroad for one continuous year by a qualifying organization may be admitted temporarily to the United States with an L visa to be employed by a parent, branch, affiliate, or subsidiary of that employer in a managerial or executive capacity, or in a position requiring specialized knowledge. This is a category that allows a person who has been working in a foreign company to be transferred to its U.S. subsidiary or affiliate company to engage in managerial, executive or specialized knowledge services. It is possible for a new U.S. company to be formed—affiliated in some way with the foreign company—but additional requirements must be fulfilled. There is nothing that prevents a foreign national from being the principal or the sole owner of both the foreign and United States entities. Initial admission may be for three years and may be extended, but this status cannot exceed a total of seven years for executives and managers, or five years for employees of specialized knowledge. Spouses and children of L visa holders may accompany them to the United States, and spouses, in particular, are allowed to obtain work permits. Once in this status, a foreign national may consider applying for lawful permanent resident status through another or related vehicle. H-1B visas allow a foreign national to work in the United States in a specialty occupation, which generally means as professionals where possession of a bachelors or higher degree or its equivalent is normally the minimum requirement for entry into the particular position, the degree requirement is common to the industry in parallel positions among similar organizations. An employer may also show that its particular position is so complex or unique that it can be performed only by an individual with a degree, and that the employer normally requires a degree or its equivalent for the position; or, the nature of the specific duties are so specialized and complex that the knowledge required to perform the duties is usually associated with the attainment of a bachelor’s degree or higher. The visa is issued for three years and may be extended up to six years; it may be extended beyond six years under certain limited circumstances. There is an annual fiscal year limitation of 65,000 H-1B visas that may be issued in a given year, commonly referred to as the "H-1B cap." Spouses and children of H visa holders may accompany them to the United States. Once in this status, a foreign national may consider applying for lawful permanent resident status through another or related vehicle. This visa allows for brief visits for business meetings, conferences, and training of a brief duration. 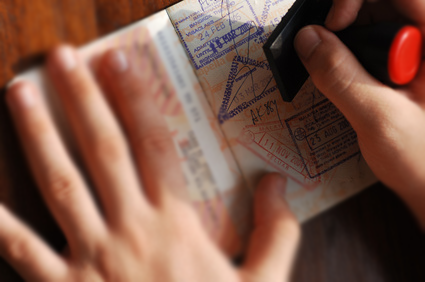 The visa is sometimes permitted for 6-month periods involving professional work activity, but may not normally be used for hands-on work activity. This visa allows visitors to engage in training or internships in the U.S. for up to 18 months to further skills in profession. Applicants must first obtain documentation from authorized sponsor. O visas allow foreign nationals who have extraordinary ability in the sciences, arts, education, business or athletics to temporarily work in the United States. The applicant must have sustained national or international acclaim and have a demonstrated record of achievement. The "O" alien must be entering the United States to continue work in the area of extraordinary ability. The maximum period of validity of an approved O petition is three years. A petitioner may seek an extension in one-year increments. P visas are reserved for athletes, artists and certain entertainers who have achieved national or international recognition as outstanding in their field. The standard is somewhat less than for O visas but the scope of eligible services is more limited. There are three subcategories: P-1. Members of entertainment groups, or individual athletes and members of athletic teams; P-2. Artists or entertainers who are part of reciprocal international exchanges; P-3. Artists or entertainers coming to perform in programs that are culturally unique. F visas allow foreign nationals to pursue education (academic studies and/or language training programs) in the United States. F-1 student visas are reserved for full-time students only. To qualify for an F-1 student visa, the foreign national must be accepted by an institution approved by the United States government and must be issued a Form I-20 by the institution. Unless the institution offers special tutoring in the native tongue, a foreign national seeking an F-1 student visa must demonstrate English proficiency. Finally, the applicant must show proof that he or she has sufficient funds to cover both tuition and living expenses, as their opportunities for legal employment are quite limited.